This post is about our trip to Namibia. Previous posts about Namibia can be found here, here and here. Before the flat tyre, quad bike riding extravaganza and the trip to the dunes, the first place we visited in Namibia was Swakopmund. Situated on the coast of the South Atlantic Ocean and surrounded by the Namib Desert on three sides, Swakopmund is a different kind of place. It's where the desert meets the sea and it is bursting with German influence. Swakopmund in German means mouth of the water. Rare sun at the beach. Very German except for the palm trees. Have you ever visited a place expecting one kind of weather and experiencing another? While I try very hard not to let weather dictate my level of enjoyment, when you go to the tropics and it's cool, windy and cloudy you can feel at a loss as to what to do with yourself especially if you've just spent a few days being battered by wind in Cape Town and were seeking some hot sun. Swakopmund isn't the tropics. It has what's called a mild desert climate, something which I didn't bother to research until I wrote this post. As sitting on the beach wasn't an option due to the wind, fog and cool temps, Mr. Deep and I decided to take a guided historic walking tour of Swakopmund. Our guide's name was Nandi. He told us his name means "never again." Nandi is the second of five children so obviously his parents changed their minds. He said he was a breech birth so I assume by the time he came out, his mother had reached her limit on pain. Nandi explained the strange weather we were experiencing wasn't really strange at all. He told us that in Swakopmund the desert and ocean air are "fighting" with each other at the coast creating fog and wind. As part of the tour we walked several blocks inland and it was quite a bit warmer and sunnier there. Swakopmund was founded as the main harbour for the Imperial German Colony in 1892 in what was then German Southwest Africa (now Namibia.) After WWI, the Germans had to hand the area over to South Africa. Later, under South African rule apartheid was imposed and black people were moved to townships. In 1990, Namibia became an independent nation. Today the Namibian economy is largely comprised of tourism and mining but unemployment sits at 40%. According to Nandi people are not content to sit around doing nothing even if they are unemployed, they will try to make something that they can sell or do something to earn a bit of money. One of the claims to fame in Swakopmund is the Kristall Galerie, home of many beautiful crystals including the world's largest quartz crystal. I can PROMISE you if not for the tour Mr. Deep and I NEVER would have visited the Kristall Galerie, and we would have likely made a joke about the "world's largest house of mud." But I'm glad we ended up stopping by and the cool weather gave us the chance to learn a few things about Swakopmund that we likely never would have known. Yes, we were allowed to touch the world's largest quartz crystal. The Swakopmund Hotel, just a few blocks from the ocean and nice and sunny! 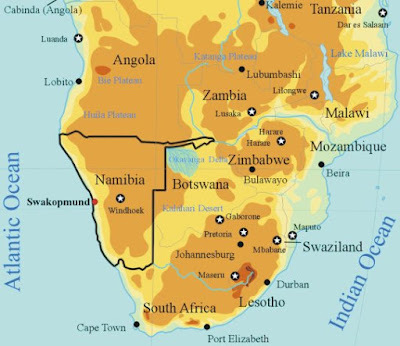 90% of Namibians are Christian mostly Lutheran and Catholic. This is a Lutheran church. German war memorial. The red paint was thrown onto the memorial by protesters earlier this year. You can read more about that here. One of three towers that the Germans used to transmit information from Swakopmund. You can see the other two in the background one on the left and the other on the right. Another interesting thing about Namibia...it's empty. There's practically no one there. This hotel is also an old age home. The revenue from the hotel supports the old age home. Nandi told us "black people we don't put old people in homes." And below the garden at the old age home. Woermannhaus and tower originally used as a lookout point. We climbed the steps to the top to enjoy the view. Swakopmund and the desert beyond. Thank you so much for reading! I'm glad you are enjoying my blog.